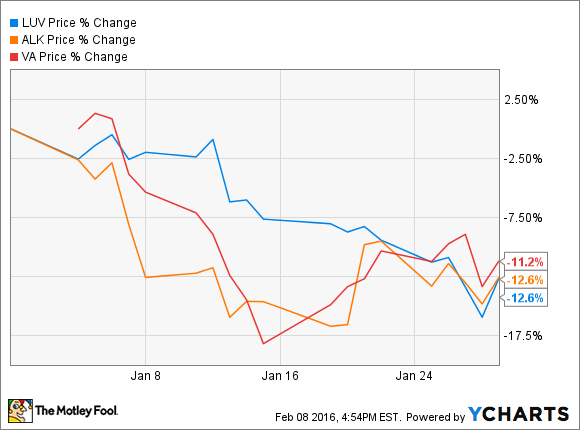 These three domestic airline stocks probably didn't deserve to get knocked down in January. What: Airlines with significant international exposure have faced severe unit revenue pressure from the strong dollar and falling fuel surcharges over the past year. By comparison, domestic airlines like Southwest Airlines (NYSE:LUV), Alaska Air (NYSE:ALK), and Virgin America (NASDAQ:VA) have posted stronger results. That didn't help domestic airline stocks weather a brutal January, though, as investors focused squarely on the ongoing industry revenue declines rather than on airlines' record profits. Southwest Airlines stock fell 13% last month, according to S&P Global Market Intelligence data. Alaska Air stock also slumped 13% in January. Rounding out the pack, Virgin America stock dropped 14%. So what: All things considered, domestic airlines like Southwest, Alaska, and Virgin America face a pretty favorable environment. Jet fuel prices spent most of January under the $1/gallon mark -- lower than at any time since 2004. On the revenue side, domestic airlines are still outperforming the global network carriers. Southwest Airlines recorded a modest 0.7% decline in revenue per available seat mile last quarter, and it projected that unit revenue will be roughly flat on a year-over-year basis in Q1. Southwest has reported stable unit revenue recently. Image source: The Motley Fool. Alaska Air and Virgin America aren't doing quite as well on the unit revenue front. Indeed, Alaska's guidance that unit revenue would fall by about 6.5% in Q4 caused much of the stock's decline in January. (The actual unit revenue decline was 6.7%.) Management expects relatively similar trends in Q1. As for Virgin America, it recently estimated that revenue per available seat mile declined by about 4.7% in Q4. It will report its final results later this month. While Alaska Air and Virgin America are closer to the legacy carriers than Southwest Airlines in terms of unit revenue trends, much of this discrepancy stems from their double-digit capacity growth. These high growth rates have an offsetting cost benefit. Favorable unit cost trends make Alaska and Virgin America better able to weather unit revenue declines than the legacy carriers. Now what: Obviously, domestic airlines aren't totally immune to the unit revenue pressure that hit the airline industry last year. To some extent, the share price declines at Southwest Airlines, Alaska Air, and Virgin America during January simply reflected that reality. Alaska Airlines has been facing unit revenue pressure. Image source: The Motley Fool. That said, revenue weakness is not nearly as big a concern for these carriers as it is for airlines with more international flights. The underlying demand for air travel in the U.S. is quite healthy. Indeed, while Alaska Air has been near the back of the pack in terms of unit revenue declines, it still grew revenue 4.3% in 2015 as it increased capacity by more than 10%. Most important, it had the highest profit margin in the airline industry last year, thanks to its low cost structure. In other words, this may be a case of being caught in the wrong place at the wrong time. Within the airline industry, the legacy carriers are bearing the brunt of the revenue pressure, but jittery investors have been selling all of their airline stocks: even relatively well-positioned domestic airlines. Long-term investors shouldn't worry too much about day-to-day stock volatility like this. Shares of Southwest, Alaska, and Virgin America are all quite cheap today. If these three domestic airlines continue to post solid earnings-per-share growth in 2016 and beyond, all three stocks should stage a strong recovery sooner or later.